wow this isn´t a biased poll at all! It’s not a yes / no question. yeah that took me a second. hysterical. Guns should be legal or illegal! Or not legal or not illegal! Do you agree or disagree? If you’re not with us, you’re against us. If you’re not against us, you’re not not against us. Or the opposite, inversely proportional. YES! NO! I DON’T KNOW! AAAAAAAAAHHHHHHH!!!!! I clicked I don’t know. Hahaha, nice. I’m totally for guns being legal or illegal, so that’s a “yes”. Moomoo you just killed my brain. I wonder what the results were. Actually it’s quite simple if you look at Amendment Two to the Constitution. Congress shall make no law infringing the right to bear arms. Steven Deschain, does the Second Amendment say anything about what we should do to keep cluelessly stupid morons like yourself from owning guns? Just curious. Way to miss the point, Steven Deschain. 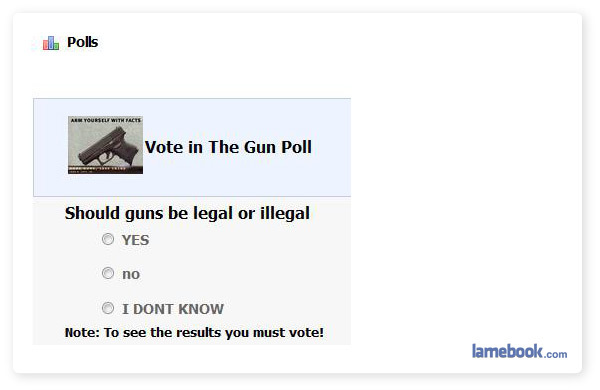 I think guns should be neither legal nor illegal, so I vote “no”. I am in favor of Gun Limbo. Amazing! I really wanted to press YES. Not sure what I would have been saying YES to, but that’s besides the point. AH! took me a second aswell!